A quick view of the most influential metrics in Winnona Park. In the southeast corner of Decatur — bordered by Agnes Scott College on the west and lovely Dearborn Park and its seven acres of paved paths and amenities to the south — is Winnona Park. The neighborhood’s 700 homes include Georgian Revival bungalows, English Vernacular Revivals, Craftsman bungalows, minimal traditional houses, townhomes, and the city’s oldest existing home, the Avary-Fulton House, built in 1868. The area was put on the National Register of Historic Places in 2002 (the distinction did not come with any restrictions when it comes to modifying or renovating homes). The area is a nature lover’s paradise, with Shoal Creek snaking through the neighborhood, a student-created butterfly garden and fish pond, and the neighborhood’s namesake park all providing ample opportunities for outdoor activities. Winnona Park also features Winnona Park Elementary School, The Waldorf School, Columbia Theological Seminary, and a number of neighborhood pubs, restaurants, and retail shops. View our selection of available properties in the Winnona Park area. 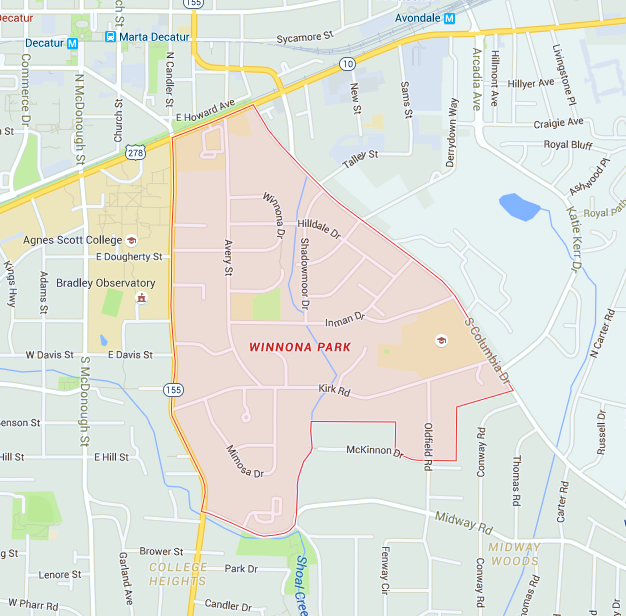 Check out the latest demographic information available for Winnona Park. Learn more about schools near Winnona Park complete with ratings and contact information. Browse through the top rated businesses in the most popular categories Winnona Park has to offer.